Pride participants pose with the children they shopped with for Christmas. Thanks are due the Cañon City High School Pride Club for community service leading up to Christmas. Roughly 50 boys and girls benefited from the Shop-With-A-Tiger program when Pride students treated them to a night of shopping, making it possible for them to provide Christmas presents for their family members. Meanwhile, The Pride also rang the bell at a Salvation Army kettle for 34 shifts over the course of 14 days in December. The result was nearly $6,300 collected, up from $2,268 last year. Thank you so much for spreading the holiday spirit Tigers! 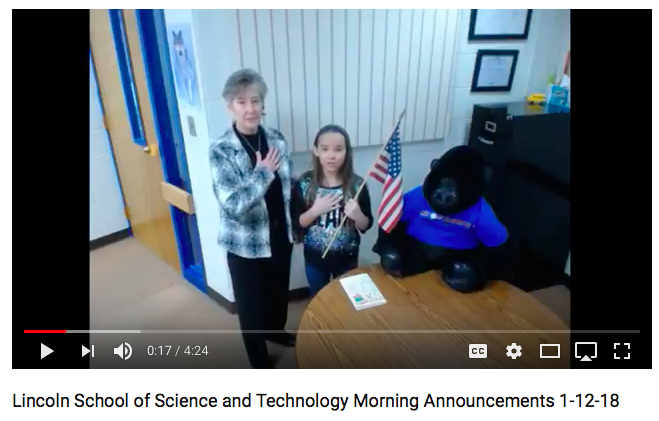 I’m impressed with work the folks at Lincoln School of Science and Technology are producing, providing their student body and the community with timely video announcements. I encourage readers to view this episode at this link: https://www.youtube.com/watch?v=UaErQN4Camk LSST has been doing this on a weekly basis since early this Fall and, thanks to the unique talents of Head Custodian Abe England, each episode simply gets better. Mr. Newton grades end of semester Public Policy presentations. At the end of fall semester several CCSD department directors and I took advantage of opportunities to observe students from Mr. Chris Newton’s Cañon City High School American Government class offer presentations on public policy issues. Topics varied, but of particular interest were those which centered on public school finance, attracting and retaining high-quality teachers, and the importance of allowing adequate time for students to eat school meals. I've been observing this work by Mr. Newton’s students for several years and am impressed with the expectations he places on them, the quality of their presentations, and the deep engagement shown by all classroom participants. Our kids are lucky to have these opportunities! On Thursday evening the Washington Elementary staff held an outstanding event they called Fit Lit Night. This gave parents and children the opportunity to blend movement activities with letter and word identification skills and reading strategies. All were encouraged to set personal fitness and reading goals for 2018. I want to thank the Washington staff for opening their doors to families, offering such fun and healthy learning activities to all. On a final note, at Monday’s regular meeting our Board of Education offered special kudos to CCHS marching band students in honor of their state championship. The board also recognized our JROTC rifle team for placing second out of 255 teams in the western regional postal match. This qualifies them for the service championship meet in Chandler, Arizona in February. 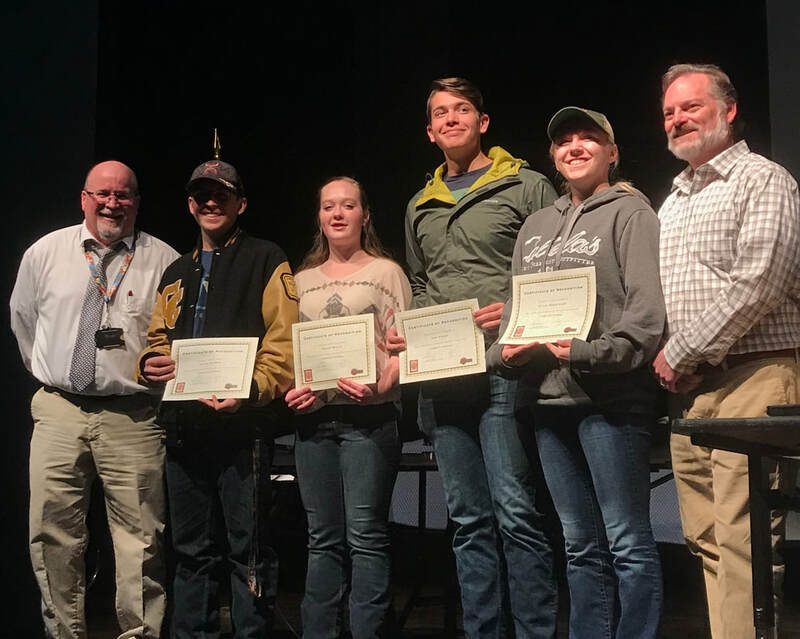 The Cañon City High School Tiger Pride Marching Band was honored at Monday's Board of Education meeting for their state championship. New Teacher Support Coach Jamie Davis guides a lesson on learning targets. Though we had no school Monday January 8th, teachers and principals reported back to work and participated in district driven staff development activities related to our K-5 math resource implementation and identifying and reporting sexual misconduct. During the afternoon, each building staff had the opportunity to engage in professional development of their choosing. New Teacher Coach Jamie Davis continues to work individually with probationary teachers ,and to guide our entire probationary staff through outstanding induction learning experiences. The Cañon 2020 Committee is taking a serious look at making the high school start time an hour later each day begiing next year, as supported by research. The next step in this process is working with the transportation department to see if this can be done with as little extra cost and as little effect on other school start times as possible. I'm in the process of conducting mid-year director evaluations, with the timing of this process to coincide with making contract recommendations to the Board of Education later this spring. I am currenlty soliciting feedback from folks who work above, below, and at the same level as each director. I’ve also begun the process of preparing for mid-year building evaluations. Climate surveys have already been sent to each staff to be completed by January 24th. These will be followed by full-day visits to schools during the month of February and the first week of March. External evaluator Ted Knight will take the lead on CCHS, CCMS and Harrison once again this year. External consultant Wendy Birhanzel will guide the Lincoln, McKinley and Washington processes. School founder Molly Merry will guide the evaluation of Cañon Exploratory. The Board honored the CCHS Rifle Team at its January 8th meeting for their outstanding performance at the Western Regional Postal Match. Director of Operations Jeff Peterson will be working a lot with Chuck Jordan and Jeff Chamberlain from RLH Engineering. Note: Beginning this week and continuing through completion of projects I will be sharing progress being made toward the commitments Cañon City Schools has made through our voter approved mill override and bond questions. LSST Principal Tammy DeWolfe begins the weekly video announcements by leading the Pledge of Allegiance. We continue preparing for an infusion of one-to-one technology at Cañon City High School next year. We’ve selected 13” Dell 3380 Touchscreen Chromebooks as teacher devices and are preparing to purchase them. We’ve also committed to the iLearn Collaborative as our staff development partner, and chosen Schoology to be our learning management system. This will assist our staff preparation. As work progresses we’ll make decisions regarding student devices, classroom display systems, technology instructional coaching, and technology maintenance support personnel. We’ll also start work to develop and adopt device use policies. Director of Finance Buddy Lambrecht, Director of Technology Shaun Kohl, Director of Instruction Adam Hartman, and I are also working to tie out a viable 10-year budget estimate for our technology infusion and renewal process to ensure we make sustainable decisions right from the beginning. Roofing repair work has already begun at Cañon City High School. In December $4 million of the $18 million dollars in bonds approved by voters were sold at a 3.2% interest rate (well below the 6% that had to be advertised in the ballot question). Funds collected are already being applied to execute our $7.5 million BEST multi-school repair project, with roofing already being installed at Cañon City High School, and the Mountain View Core Knowledge School building loan already paid off. Also in December, the district solicited proposals to hire an Owner's Representative firm to guide the process of implementing its $7.5 million repair project, support efforts to secure BEST grants to replace Cañon City Middle School and Washington Elementary School, and to possibly guide the process of building those schools. RLH Engineering was chosen to fill this role and the Board of Education approved their contract at Monday's meeting. As a reminder, Cañon City taxpayers are supporting this work with $2.5 million. The rest of this funding is being supplied by a $5 million BEST grant. On Tuesday, January 9th the district began soliciting proposals to hire a design-build architect/construction team to execute its $7.5 million facilities repair grant, support the acquisition of BEST grants to build new CCMS and Washington schools, and possibly design and build both new schools. Proposals must be submitted by January 24th. We conducted district-wide staff development activities with instructors on Monday. I also attended our school board work session and meeting on Monday. During the rest of the week I was able to fit in two hours on BEST grant writing and communicate about mid-year building evaluation processes. 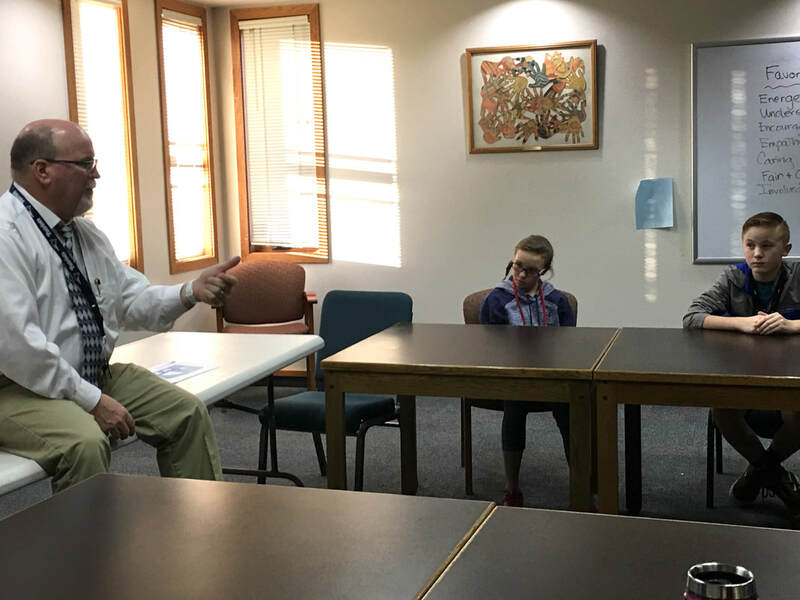 On Tuesday, I attended a Harrison Building Leadership Team meeting, met with the Cañon City Middle School student council members aout their possible new school, held a SAC meeting, and participated in a phone conference with Colorado Education Initiative (CEI) leaders. On Wednesday, I focused on office work and staff communication. On Thursday, I attended a CCEA officers touching base session, worked with Director of Instruction Adam Hartman on Federal Programs reports, and attended the CCHS Tech Deployment and Cañon 2020 meetings. On Friday, I went to a regional superintendent meeting and had a touching base session with Director of Human Resources Misty Manchester. This week I have a marathon federal programs/UIP work session with Mr. Hartman, I’ll meet with parents about expulsion, attend the CCHS Building Leadership Team meeting, hold an employment dismissal hearing, hold a District Accountability Committee meeting, meet with classified association leaders, meet with CCHS special education department leaders, attend a technology deployment committee meeting, attend the CCHS High School Parent Advisory Committee meeting, and review Design-Build candidate questions so we can submit responses to interested parties. Did you know Colorado law allows highly gifted students early access to kindergarten or first grade? Early Access is for 4-year olds ready for kindergarten and 5-year olds ready for first grade if they meet qualifying criteria. CCSD's Early Access process serves the few highly advanced gifted children who require comprehensive academic acceleration. Highly advanced means a student scores in the top one-tenth percentile. That is one child in one thousand! Thus, early access is not recommended for the majority of age four and five gifted children. What is the process by which we identify students? Parents should check with their early childhood provider to see if their child is a good candidate for early access. If so, the parent must write a letter of intent to our Coordinator of Gifted Education to receives a portfolio packet. This letter is due to our Gifted and Talented Education office by February 1st. Parent can work with early childhood providers work to complete this portfolio Parents must then submit this portfolio to the Coordinator of Gifted Education for review. Parents of preschoolers who have questions about this process should contact CCSD GATE Coordinator Shyla Christiansen at 719-276-6168.